Mellow Sundance, Tow Line, Backstage World Championships, Bike In Winter, Ask The Expert. Why Senior Snowsport Enthusiasts Should Practice Yoga. Preface: We are not medical experts, health care professionals, or physical therapists. We have, however, been practicing yoga for the past three years. Twice a week for most weeks. So, we can report what the impact has been on our body and our ability to feel athletic outdoors in winter, whether skiing down a hill or cross-country skiing across a field. As we age, it is essential to keep our muscles and joints toned up. Basically, it’s a use-it-or-lose-it scenario. Working out with light weights on a consistent basis can keep sarcopenia—the weakening of muscles as you age—at bay. If you aren’t aware of sarcopenia’s effect on senior muscles, you aren’t alone. Click here for our discussion of what sacropenia is and what you can do about it. But there is another important aspect of conditioning that seniors need to pay attention to: Flexibility. That’s where yoga comes in. Tense, contracted muscles, ligaments and tendons inhibit motion, cause pain, and can lead to pulls and sprains. Those querulous hip flexors and lower back muscles can wreck your day (or week) or even cause you to give up outdoor activities. Think of yoga as a sophisticated and comprehensive process of stretching and moving muscles and joints throughout your body. Add a focus on breathing which helps concentration and facilitates movement as well as the discipline of sustained, varied, and regular practice, and you have a means of transforming your body. We’ve found our posture is improved, we find suppleness when we ski, we can get our boots on without gasping, and we’re more in touch with our physical being, aware of how we stand, sit, and move. So, we recommend our readers find a good instructor and head to yoga practice. There are online apps like DownDog. which can get you started. However, an instructor can give you nuanced cues on how to correctly do the different poses and provide variations that will allow you to get the best of what you can do. Positioning your body properly makes a huge difference, something that is often not specific in online instruction. There are also different types of yoga to choose from. We think you should start with an “easy” or “basic” class. This level of yoga will not have you contorting into pretzel shapes or standing on your head. Instead, you will be systematically working throughout your physical landscape. When you feel those tight shoulders, hamstrings, or hips lose their tension, and the stress disappear from your neck, you will feel positively different. If you currently practice yoga, let us know what your advice is for neophytes. Last week’s Mystery Glimpse is revealed. 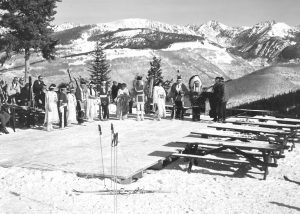 We are amazed some readers actually identified a ritual snow dance performed by members of the Ute tribe at Vail’s inaugural season back in 1962. BTW, it worked. Pete Seibert had it right. 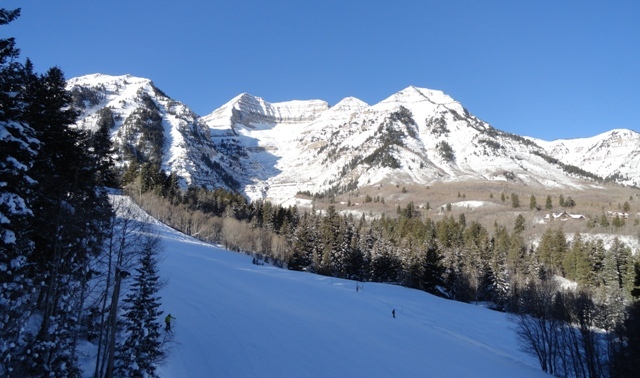 Correspondent Harriet Wallis offers two articles: A resort review of a very mellow-sounding Sundance resort and a backstage look at what goes on in a world championship competition. And, if you live in that part of the world were snow is scarce, you can still head out to the hills on your mountain bike. Correspondent Pat McCloskey shows how to ride your bike in the winter, what it takes, and offers suggests for different required equipment. Check out our new Ask The Expert feature, too. This week, Steve Cohen of MasterFit offers advice to a reader on how to get a decent pair of ski boots. Thanks for reading SeniorsSkiing.com. Please consider sending in a contribution to support our online magazine. Tell your friends about us and remember, there are more of us every day, and we aren’t going away.